Except for the years 1680–1692, when, as a result of the Pueblo Revolt, the native Pueblo people drove the Spaniards out of the area known as New Mexico, later to be reconquered by Don Diego de Vargas, Santa Fe remained Spain’s provincial seat until the outbreak of the Mexican War of Independence in 1810. In 1824 the city’s status as the capital of the Mexican territory of Santa Fé de Nuevo México was formalized in the 1824 Constitution. The Republic of Texas had claimed Santa Fe as part of the western portion of Texas along the Rio Grande when it seceded from Mexico in 1836. In 1841, a small military and trading expedition set out from Austin, Texas, with the aim of gaining control over the Santa Fe Trail. Known as the Santa Fe Expedition the force was poorly prepared and was easily captured by the Mexican army. In 1846, the United States declared war on Mexico, and Brigadier General Stephen W. Kearny led the main body of his Army of the West of some 1,700 soldiers into the city to claim it and the whole New Mexico Territory for the United States. By 1848 the U.S. officially gained New Mexico through the Treaty of Guadalupe Hidalgo. Colonel Alexander William Doniphan under the command of Kearny recovered ammunition from Santa Fe labeled “Spain 1776” showing both the quality of communication and military support New Mexico received under Mexican rule. For a few days in March 1862, the Confederate flag of General Henry Sibley flew over Santa Fe, until he was defeated by Union troops. On October 21, 1887, “The Padre of Isleta”, Anton Docher went to New Mexico where he was ordained as a priest in the St Francis Cathedral of Santa Fe by Bishop Jean-Baptiste Salpointe. After a few years spent in Santa Fe, Bernalillo and in Taos, he arrived in Isleta on December 28, 1891. He wrote an interesting ethnological article published in The Santa Fé Magazine on June,1913, in which he describes the early 20th century’s life in the Pueblos. 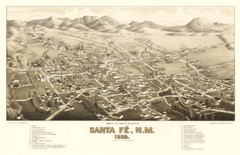 In 1912, New Mexico became the United States of America’s 47th state, with Santa Fe as its capital.